Longline is the primary gear used to catch bigeye tuna around the world. About 40,000 t of bigeye were caught with longlines in the Atlantic Ocean in 2013, although they are being increasingly landed as bycatch from the FAD purse seine fleet for yellowfin and skipjack. In 2013, purse seine catches of bigeye in the east Pacific were 49,000 t and in the west, 71,000 t were landed. Purse seine catches of bigeye in the Indian Ocean were lower: about 20,000 t—half of which was landed with FADs. Purse seine catches in the Atlantic Ocean were 22,868 t in 2013 (although substantial under-reporting is also believed to be occurring). Bigeye tuna are large, pelagic predators capable of reaching a weight of 250 kg and growing to over 2 m in length. Due to a high age at maturity and other-life history characteristics, this species has a medium inherent vulnerable to fishing. There are substantial uncertainties surrounding the most recent bigeye stock assessment in the Atlantic, with estimates of biomass and fishing mortality fluctuating around their reference points. The management body responsible for bigeye tuna in the Atlantic Ocean is the International Commission for the Conservation of Atlantic Tunas (ICCAT). Management regulations include fishing limits and regular stock assessments. Some uncertainties surround the stock assessments and data quality could be improved. Management abides by scientific advice regarding catch levels. Fish-aggregating devices (FADs) are large objects left in the ocean to attract a target tuna species (e.g., skipjack tuna). However, they also attract numerous other marine species (including other tunas, sharks, sea turtles, and birds). Many of the tuna they catch in association with their target catch are juveniles, and some of the non-target species caught are also of threatened or endangered status. Of special concern are catches of manta rays and silky sharks. Pelagic longlines are a nonspecific fishing method. Bycatch in the form of billfish, sharks, sea turtles and seabirds occurs. Non-target species caught include several threatened or endangered status such as green sea turtles, hawksbill turtles, leatherback turtles, silky sharks and albatrosses. Some purse seines using FADs are anchored to the seafloor, but most do not contact the bottom and therefore cause minimal habitat damage. Nonetheless, the use of FADs could still impact the surrounding ecosystem. Juvenile tuna, specifically bigeye and yellowfin, are often associated with FADs and if fleets continue to catch these smaller fish, growth and recruitment overfishing of these stocks may occur. Pelagic longlines have minimal impacts on the habitat as they rarely make contact with the seafloor. Nonetheless, the fishery removes ecologically important species such as other tunas, billfish and sharks. This may have negative effects on the ecosystem. Other ecosystem effects of longline fisheries are not well understood. The IATTC is working on ecosystem based models in order to take these effects into consideration. Greenstick gear was developed to reduce the high bycatch levels that are characteristic of longlines. Longlines and purse seines are the main gears used to catch bigeye tuna in the Western Atlantic. Catches of bigeye peaked in 2001 at 100,000 tonnes but have declined since, with 63,066 tonnes caught in 2013. Bigeye tuna are large, pelagic predators capable of reaching a weight of 250 kg and growing to over 2 m in length. Due to a high age at maturity and other-life history characteristics, this species has a medium inherent vulnerable to fishing. Based on the 2013 stock assessment, there are substantial uncertainties surrounding the most recent bigeye stock assessment in the Atlantic, with estimates of biomass and fishing mortality fluctuating around their reference points. As greenstick fishing occurs within federal waters of the US, the US National Marine Fisheries Service (NMFS) is the organization responsible for the greenstick bigeye tuna fishery. Management has been successful at reducing bycatch by introducing greenstick gear. Catches of non-target species of concern such as Atlantic Bluefin tuna, sea turtles, and sea birds has been reduced. There are no catch limits for bigeye caught in the greenstick fishery, but a minimum size limit exists. Other regulations include fishing permits, maintenance of logbooks, and compliance with international regulations set by the International Commission for the Conservation of Atlantic Tunas (ICCAT). Bigeye is included in a multi-year conservation plan under ICCAT and stock assessments are performed every 4-6 years. Due to its high selectivity, greenstick gear cause minimal bycatch. 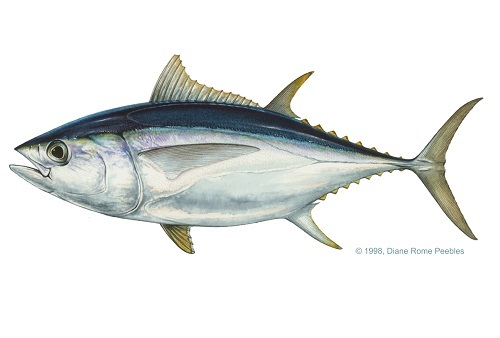 Yellowfin tuna are primarily caught by greenstick, and bigeye tuna comprise 10% of the catch. Other incidental catches include other tuna species, mahi mahi and other bony fish. Greensticks do not make contact with the ocean floor and therefore cause little to no habitat damage. Longline is the primary gear used to catch bigeye around the world. About 40,000 t of bigeye were caught with longlines in the Atlantic Ocean in 2013, although they are being increasingly landed as bycatch from the FAD purse seine fleet for yellowfin and skipjack. Purse seine catches of bigeye in the Indian Ocean were lower: about 20,000 t—half of which was landed with FADs. Bigeye tuna are large, pelagic predators capable of reaching a weight of 250 kg and growing to over 2 m in length. Due to a high age at maturity and other-life history characteristics, this species has a medium inherent vulnerable to fishing. Based on the 2013 stock assessment, the Indian Ocean bigeye tuna stock is not currently overfished and fishing mortality is low. The management body responsible for the management of all tuna in the Indian Ocean is the Indian Ocean Tuna Committee (IOTC). Regular stock assessments are performed, and catch limits and spatial closures have been set up for bigeye in recent years. The IOTC also has management measures in place specific to purse seine fisheries. Countries had to submit a FAD management plan to the Commission by the end of 2013. However, the information required for these plans does not need to be submitted until 2015. In addition, there are ongoing concerns of vessel non-compliance with regulations, and improper catch reporting by member fishing countries is also a common occurrence. Fish-aggregating devices (FADs) are large objects left in the ocean to attract a target tuna species (e.g., skipjack tuna). However, they also attract numerous other marine species (including other tunas, sharks, sea turtles, and birds). Many of the tuna they catch in association with their target catch are juveniles, and some of the non-target species caught are also of threatened or endangered status. Of special concern are catches of manta rays and silky sharks. Pelagic longlines are a nonspecific fishing method. Bycatch in the form of billfish, sharks, sea turtles and seabirds occurs. Non-target species caught include several threatened or endangered status such as green sea turtles, hawksbill turtles, leatherback turtles, silky sharks and albatrosses. Some purse seines using FADs are anchored to the seafloor, but most do not contact the bottom and therefore cause minimal habitat damage. Nonetheless, the use of FADs could still impact the surrounding ecosystem. Juvenile tuna, specifically bigeye and yellowfin, are often associated with FADs and if fleets continue to catch these smaller fish, growth and recruitment overfishing of these stocks may occur. Pelagic longlines have minimal impacts on the habitat as they rarely make contact with the seafloor. Nonetheless, the fishery removes ecologically important species such as other tunas, billfish and sharks. This may have negative effects on the ecosystem. Other ecosystem effects of longline fisheries are not well understood. The IATTC is working on ecosystem based models in order to take these effects into consideration. Longline is the primary gear used to catch bigeye around the world, although they are being increasingly landed as bycatch from the FAD purse seine fleet for yellowfin and skipjack. In 2013, purse seine catches of bigeye in the east Pacific were 49,000 t and in the west, 71,000 t were landed. Bigeye tuna are large, pelagic predators capable of reaching a weight of 250 kg and growing to over 2 m in length. Due to a high age at maturity and other-life history characteristics, this species has a medium inherent vulnerable to fishing. Based on the most recent stock assessment in the western Pacific, bigeye is currently overfished, with overfishing continuing to occur. In the eastern Pacific, the stock is slightly overfished but no overfishing is occurring. The management body responsible for management of all tuna in the western Pacific Ocean is the Western and Central Pacific Fisheries Commission (WCPFC), and in the eastern Pacific it is the Inter-American Tropical Tuna Commission (IATTC). Although many management measures exist, there are no limits on the number of FAD sets used per year and management has thus far been ineffective in reducing bycatch of bigeye on FAD sets. Fish-aggregating devices (FADs) are large objects left in the ocean to attract a target tuna species (e.g., skipjack tuna). However, they also attract numerous other marine species (including other tunas, sharks, sea turtles, and birds). Many of the tuna they catch in association with their target catch are juveniles, and some of the non-target species caught are also of threatened or endangered status. Of special concern are catches of manta rays and silky sharks. Pelagic longlines are a nonspecific fishing method. Bycatch in the form of billfish, sharks, sea turtles and seabirds occurs. Non-target species caught include several threatened or endangered status such as green sea turtles, hawksbill turtles, leatherback turtles, silky sharks and albatrosses. Some purse seines using FADs are anchored to the seafloor, but most do not contact the bottom and therefore cause minimal habitat damage. Nonetheless, the use of FADs could still impact the surrounding ecosystem. Juvenile tuna, specifically bigeye and yellowfin, are often associated with FADs and if fleets continue to catch these smaller fish, growth and recruitment overfishing of these stocks may occur. Pelagic longlines have minimal impacts on the habitat as they rarely make contact with the seafloor. Nonetheless, the fishery removes ecologically important species such as other tunas, billfish and sharks. This may have negative effects on the ecosystem. Other ecosystem effects of longline fisheries are not well understood. The IATTC is working on ecosystem based models in order to take these effects into consideration.